OZ2OE Technical Home Page - Cross element yagi's for circular polarisation. The following pages are from an article I wrote in the AMSAT OZ newsletter No. 25, April 1994. The 144 and 432 MHz cross element yagi's - mounted on a PVC (non conducting) tube. 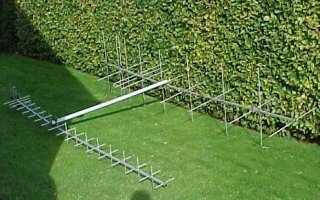 The pages describes the building of two cross element yagi's for satellite communication: 2x8 element for 144 MHz and 2x18 element for 432 MHz. Both antennas are based on earlier linear polarized designs; but here two identical yagies are mounted (-perpendicular to each other) on the same boom , with one positioned a quater wavelength in front of the other. By doing so the phasing cable network becomes much simpler, because the necessary 90 degree delay between the horizontal and vertical signal components are done in space and not through a piece of cable. Unwanted impedance transformation, that could arise from having a quater wavelength difference in cablelength to the two dipoles, is avoided. If antennas were ideal - exactly 50 ohm - there should be no difference between the two methods, however in real life antennas are hardly 50.00 ohms, and therefore unequal length af cable gives unequal transformation - and as a result, some degree of elliptical polarization! Furthermore when mounted on the same boom, the antenna keeps circularity much better for slant angles, than a system where the individual antennas are mounted on separated booms. The two drawings are copies from the original article - expect a few Danish words.